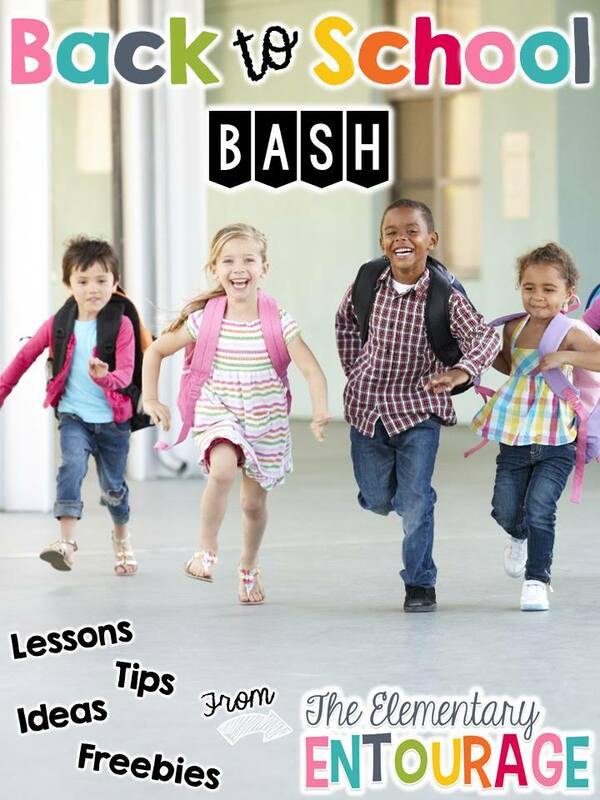 My collaborative blog, The Elementary Entourage, is having a Back to School Bash linky party where we get to share ideas, lessons, tips, and FREEBIES with all of you! Since schools around Indiana have been in sessions for weeks now, I’m not going to share open house or first week ideas with you. Instead, I thought I’d share some tips on how to get your centers started. There are some affiliate links in this post. Last Summer, I spent HOURS sorting all of my centers into tubs by skill. I used to do it month by month because I had many themed activities. When I wanted to review a skill, it was hard to remember where it was. 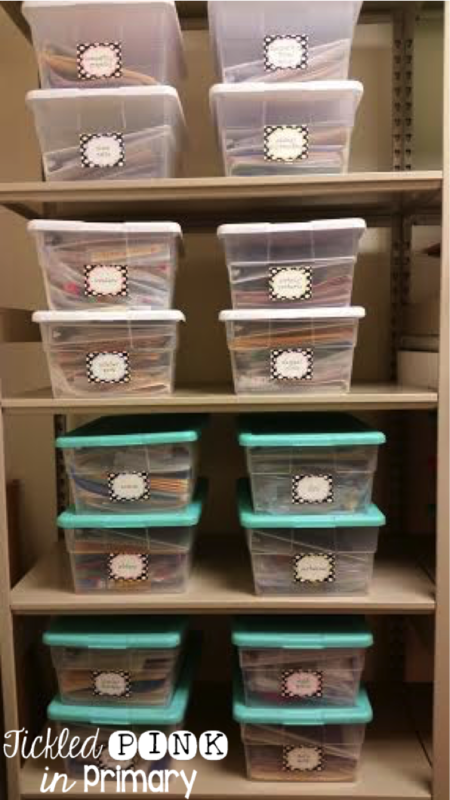 The containers with white lids are my math activities and the teal lids have reading activities. Being organized with save you A LOT of time when prepping centers. I found this containers on Amazon here. Once I am ready to put activities into my centers, I use these plastic containers with lids. Having lids instead of open containers is so much nicer and keep everything together and organized. I only put 2-3 activities in each center. If there is an activity I find very useful, I will tell them they have to do that first, then they can choose the other games to play. I have changed the way I organize my center chart many times over the year whether it be how many kids are in a group, how many centers to have going at once, what to name the centers, etc. This chart below is when I did a bit of Daily 5 activities the year I taught 2nd grade. I have math cards as well and they are all editable so you can make them fit your classroom. You can find these Reading & Math Center Cards in my TPT store. When I first started teaching, I had many centers going at once. That was a bit too hard to prepare for and keep organized. Below are the Literacy Center Cards that I used to use. It also seemed that many of them could’ve been combined such as 1 center called “library” instead of listening, big books, puppets, etc. Those are all about reading and interacting with books, so I’ve started to make my centers more vague instead of so specific. Over the years, I’ve found that fewer students in a center, the better. It keeps the noise level down and keeps them focused. When starting centers at the beginning of the year, it is CRUCIAL to MODEL, MODEL, MODEL everything, especially in Kindergarten! Students need to see what noise level they are supposed to work at, how to play the games, how to work with friends, what to do if there is a problem, how to get out the centers, how to clean up, how to rotate, etc. You cannot assume that they know what to do! Start off s-l-o-w by playing the activities whole group, then let students model how to do it. It will take a month or 2 before you are fully running centers. That is ok!! One way to make centers easier for students is to have consistency. I have many of the same activities throughout the whole year, so all I have to do is switch the skill, but the students already know the format and rules of the activity. This game below has students working on practicing letters and sounds. I use this game format all year, but switch out the game board for a new theme, and switch the cards for sight words, word families, numbers, money, etc. This game can be played where students match up uppercase and lowercase letters, match the letters to the correct beginning sound, or play Memory with the cards. I like when activities can be played in a variety of ways to make it interesting for students. It’s also an easy way to differentiate learning for your students. I will also do similar games like this for math and reading centers throughout the year. This activity below is as easy as filling in the missing numbers. Once again, change out the worksheet and the students are ready to go! Graphing centers are another activity I do monthly. Students can never get enough graphing! I put the colored worksheets in sheet protectors to make them re-usable and the students love using the dry-erase markers with these! It also save me on copies. In Kindergarten, the students answer the questions about their graph with drawings until they are able to write. All of these center activities and more can be found in my Back to School Literacy & Math Bundle. This is a great freebie! Thanks so much! !